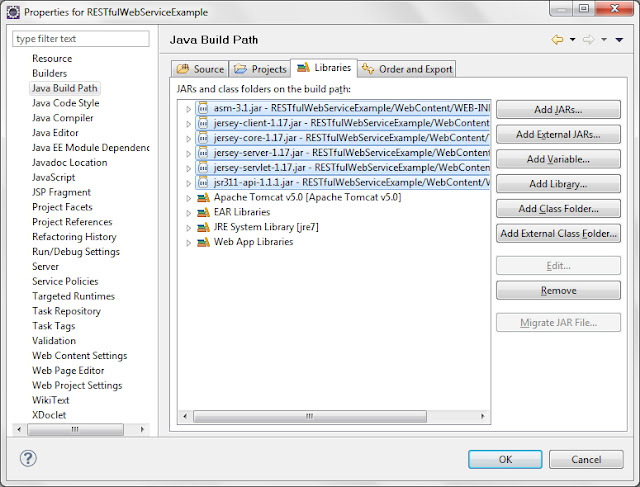 Java API for RESTful Web Services (JAX-RS), is a set if APIs to developer REST service. JAX-RS is part of the Java EE6, and make developers to develop REST web application easily. Jersey is the reference implementation for this specification. Jersey contains basically a REST server and a REST client. 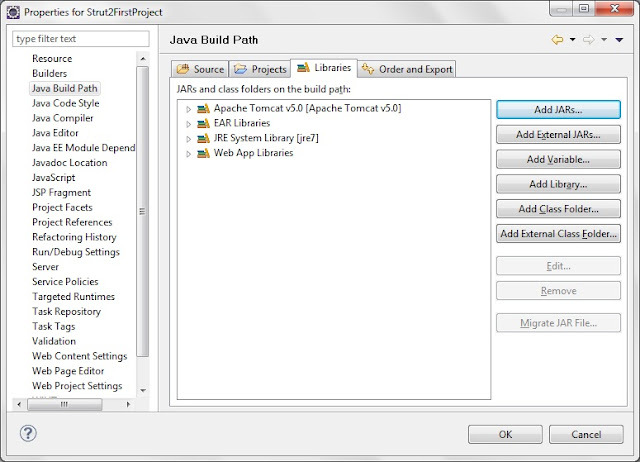 The core client can communicate with the server using jersey lib. 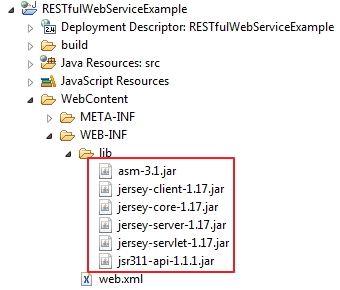 On the server side Jersey uses a servlet which scans predefined classes to identify RESTful resources. Via the web.xml configuration file for your web application. This servlet analyzes the incoming HTTP request and selects the correct class and method on request. This selection is based on annotations provided in the class and methods. 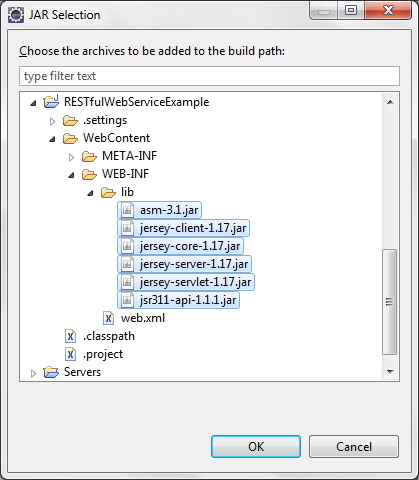 Let’s see Restful web services example in java now. Click ok.Jersey jars added to class path. + "<Inch>" + inch + "</Inch>"
+ "<Feet>" + feet + "</Feet>"
@Path(/your_path_at_class_level) : Sets the path to base URL + /your_path_at_class_level. The base URL is based on your application name, the servlet and the URL pattern from the web.xml” configuration file. @Produces(MediaType.TEXT_XML [, more-types ]): @Produces defines which MIME type is delivered by a method annotated with @GET. In the example text (“text/XML”) is produced. @PathParam: Used to inject values from the URL into a method parameter.This way you inject inch in convertFeetToInch method and convert that to feet. In above ,put your web service package. 9) Test your REST service under: “http://localhost:8080/RESTfulWebServiceExample/rest/ConversionService/FeetToInch/2”. If You see web service information page then you are done. 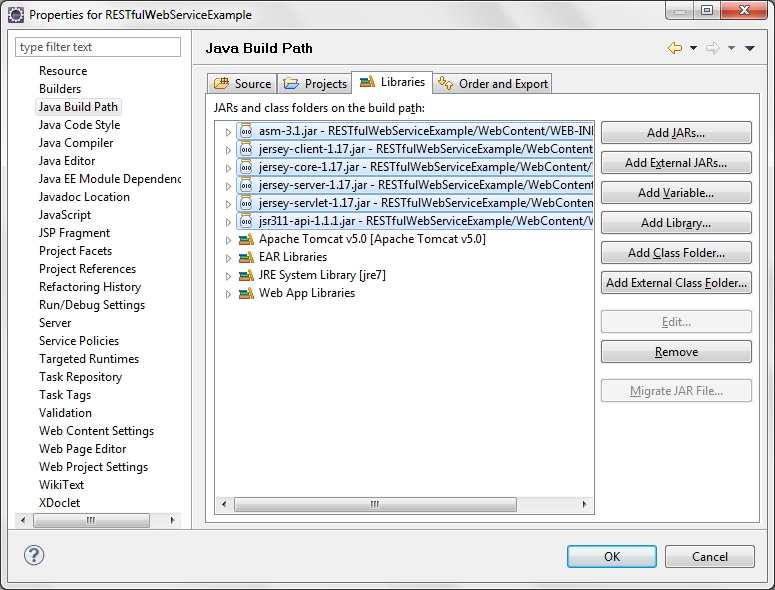 That’s all about Restful web services example in java. also my experience, as per donm – thanks for these great tutos, Arpit! !